says it all (click on to enlarge). After consolidating for 5 months near its all-time high, AAPL has finally broken out. While there is no guarantee with stocks, most stocks that act this way have a long way to advance. 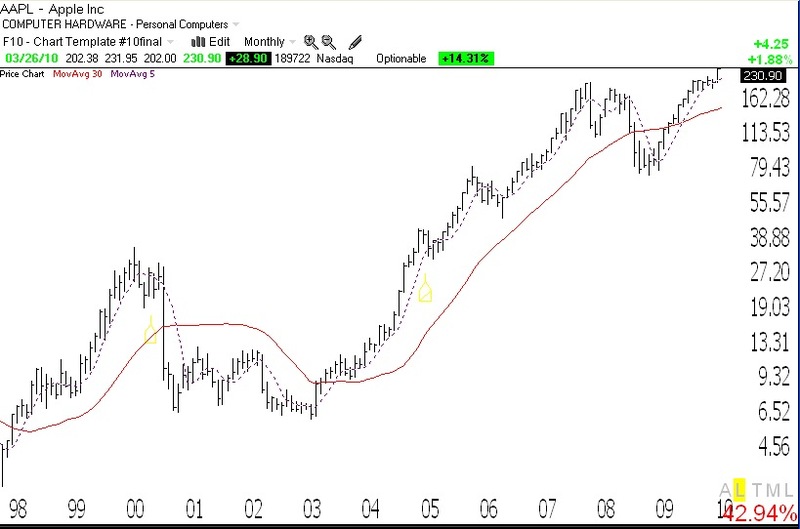 Look how AAPL climbed in 2007, once it broke out. The iPad comes out next weekend and we shall see if iPad mania propels the stock. (I own it.)…….. Meanwhile, the GMI and GMI-R remain at their maximum values. Some of my indicators have receded, though. The Worden T2108 Indicator is now at 79%, down from 86% on Wednesday. And only 46% of Nasdaq 100 stocks closed with their daily MACD (12/26/9) above its signal line, down from the 80’s last week. 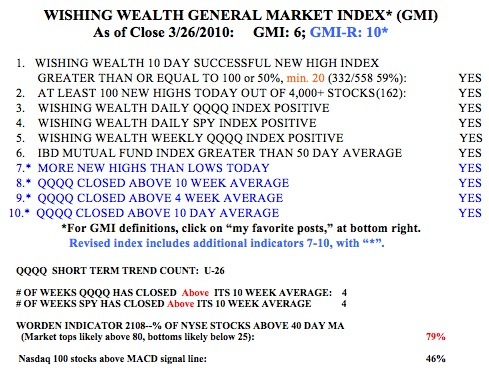 Friday was the 26th day of the current QQQQ short term up-trend (U-26), by my definition. During that time, the QQQQ has risen 7%, while the ultra long QQQQ ETF (QLD) has advanced almost 15% and TYH has advanced 13%. During that same period, only 17% of the stocks on the IBD100 list published on 2/22 rose more than QLD did. Again, I learn that it may be better to just ride the ultra index ETF’s than to try to find the few stocks that will beat it. The next time my QQQQ short term trend indicator turns down, I will probably go short QQQQ with the ultra bear ETF, QID.